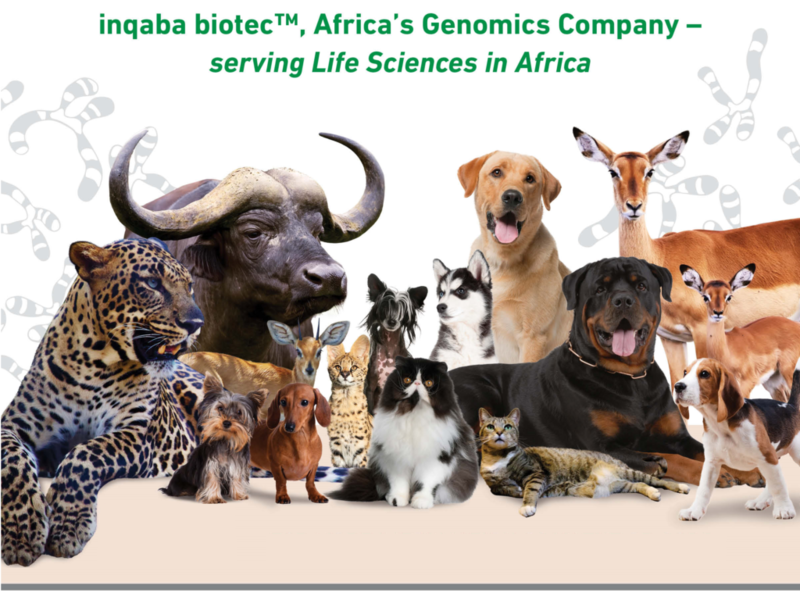 The Animal Genetics Department at Inqaba Biotechnical Industries (Pty) Ltd provides a myriad of accurate genetic tests (health, colour, DNA fingerprinting) to the domestic, livestock and wildlife industries. Our laboratory is state-of-the-art and holds the gold standard in sequencing and fragment analysis technologies. We are streamlined for high-throughput processing guaranteeing processes are standardised and compliant with international and local standards and regulations. Genetic diseases affect many canine breeds. To date, there is no cure for any canine genetic diseases. Consequently, affected canines may experience painful, distressed and often shortened lifespans. The genetic tests on offer at inqaba biotec™ are able to determine whether your canine family member is clear of a disease, is a carrier for the disease or is affected by the disease. 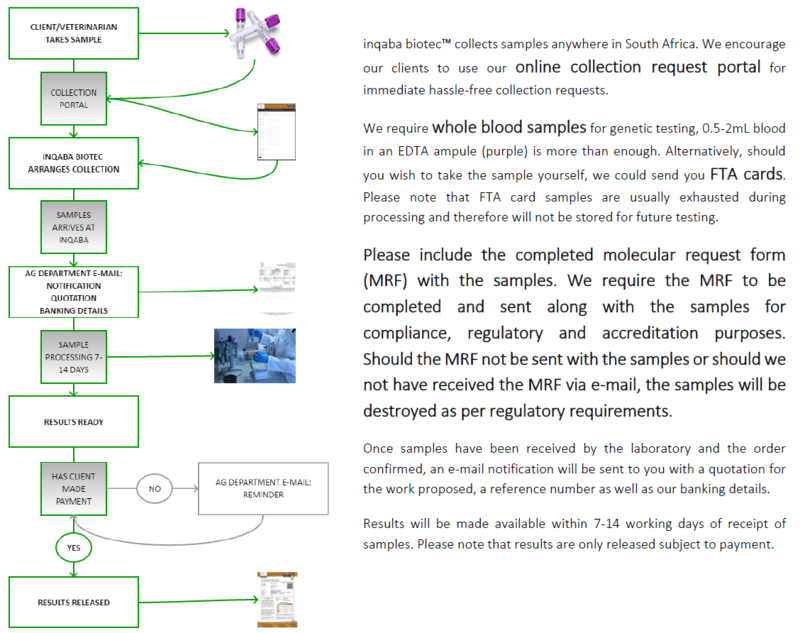 Ready to send us your samples? Please complete the canine molecular request form. To arrange collection, please click here. For more information, please contact us by e-mail. As of 1 April 2018, KUSA instituted the requirement of a DNA profile for registration and transfer of registered ownership of dogs. In the absence of whole blood samples in EDTA ampules, we will accept FTA cards. Please note that FTA card samples will be exhausted during processing and therefore will not be stored for future testing. Should you require a DNA profile or parentage and storage for future tests, the only acceptable sample type is whole blood in an EDTA ampule. What are FTA cards and how do I take a sample? Click here to learn more. inqaba biotec™ is currently updating our feline genetic testing portfolio. These tests are developed on a demand basis. Should you wish for us to develop a particular feline genetic test, please contact our Animal Genetics Department directly by e-mail. Ready to send us your samples? Please complete the feline molecular request form. To arrange collection, please click here. For more information, please contact us by e-mail. Buccal swabs will be accepted from cats. Only approved buccal swabs provided by inqaba biotec™ will be accepted. For conservation genetics services please contact us by e-mail to arrange a consultation. For wildlife genetics services please contact us for more information by e-mail. We have partnered with Global Supplies, who has been at the cutting edge of delivering top class products and services to the wildlife industry for the last 16 years.